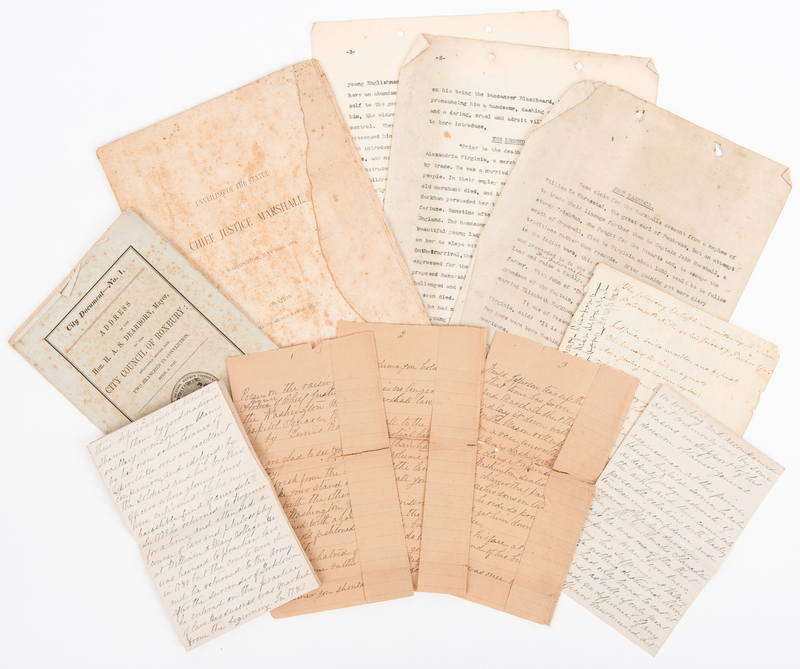 Six (6) Marshall and Dearborn family speeches, poems, and essays. 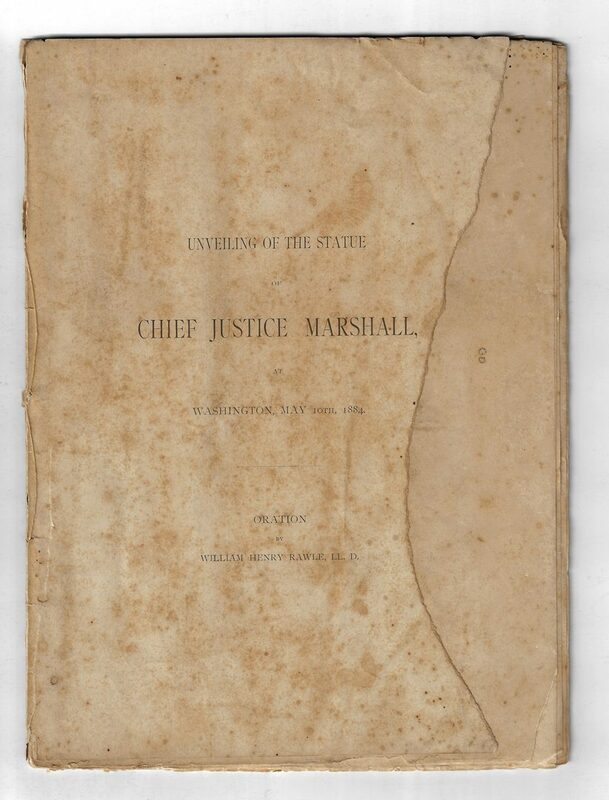 1st item: Booklet titled "Unveiling the Statue of Chief Justice John Marshall, at Washington, May 10th, 1884" with an oration by William Henry Rawle, LL. D., published by Allen, Lane, and Scott's Printing House, Philadelphia, 1884. 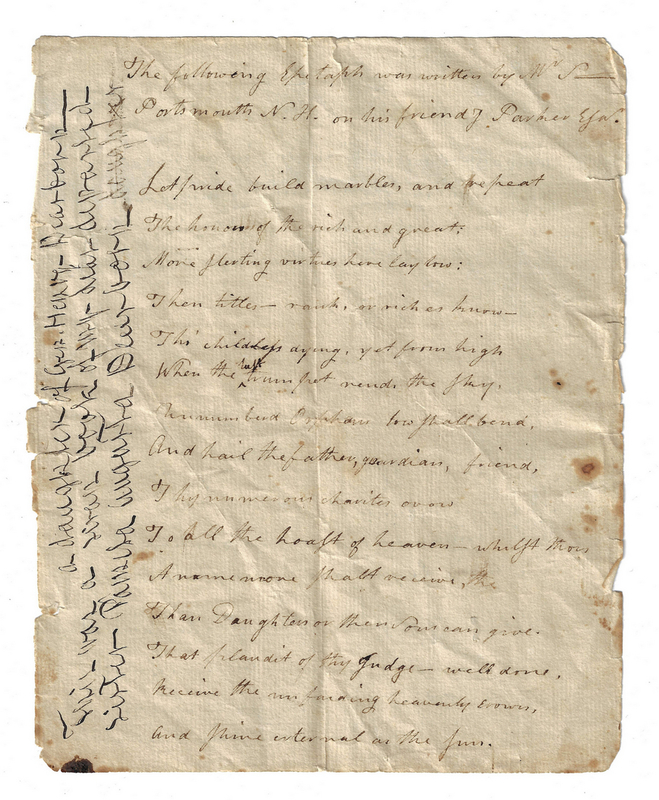 10" H x 7 5/8" W. 2nd item: One (1) page ink on laid paper poem titled "An Addre[s]s to a Husband" by Pamela Augusta Dearborn Gilman (1780-1799), daughter of General Henry Dearborn (1750-1829), to her husband Allen Gilman (1773-1846), undated. Later ink inscription reading "a daughter of Gen. Henry Dearborn This was a scrap book of my dear departed sister Pamela Augusta Dearborn" with the word "daughter" slightly scratched out, written either by Sophia Dearborn (1775-1814) or Julia Cascaline Dearborn (1795-1867), her sisters who outlived her. 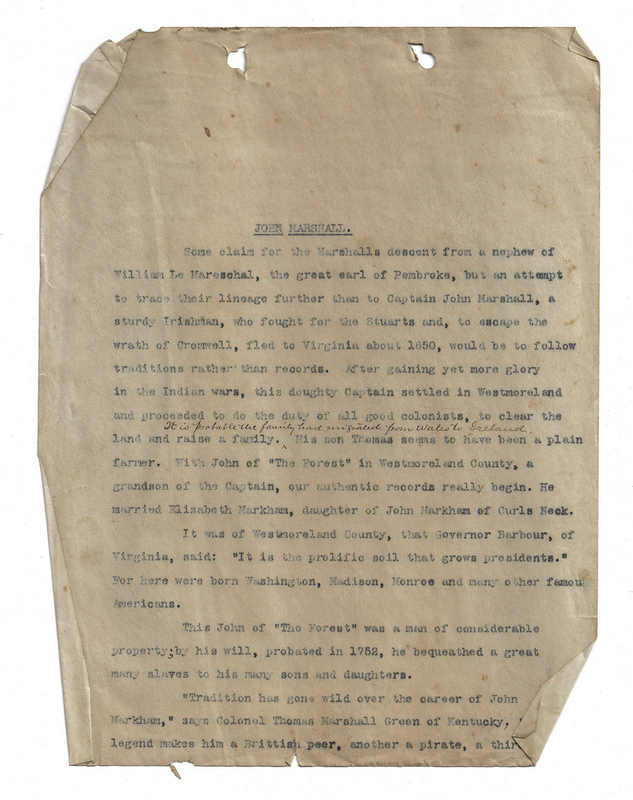 7 7/8" H x 6 1/4" W. 3rd item: Booklet titled "City Document–No. 1. Address of the Hon. 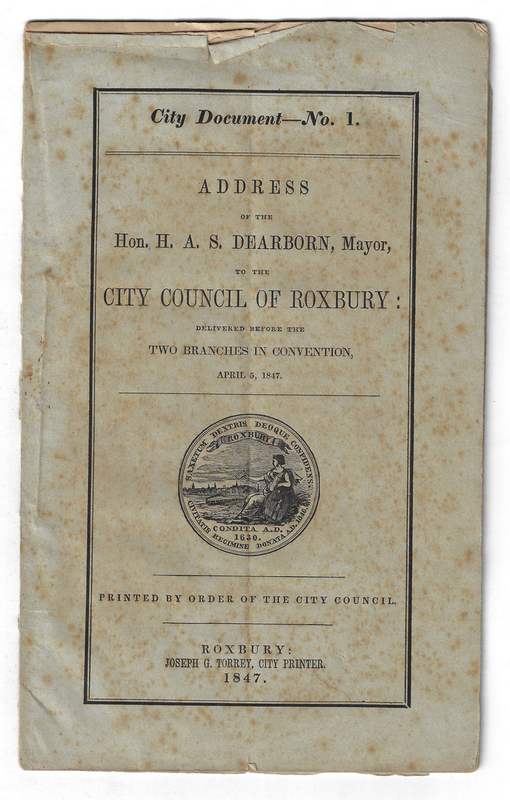 H. A. S. Dearborn, Mayor, to the City Council of Roxbury: Delivered Before the Two Branches in Convention, April 6, 1847" printed by order of the city council by Joseph G. Torrey, Roxbury, 1847. 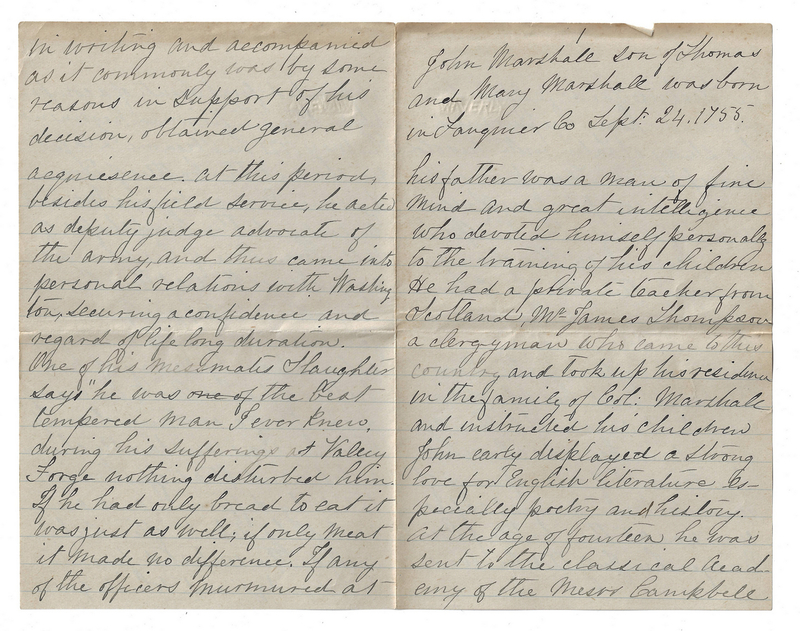 9 1/8" H x 5 3/4" W. 4th item: Three (3) page typed essay titled "John Marshall", unsigned and undated. Similar in style to "The Marshall Family: Or A Genealogical Chart of the Descendants of John Marshall and Elizabeth Markham, His Wife, Sketches of Individuals and Notices of Families Connected with Them" by William McClung Paxton, published by R. Clarke & Company, Ireland, 1885. All three pages with two hole punches top of page. 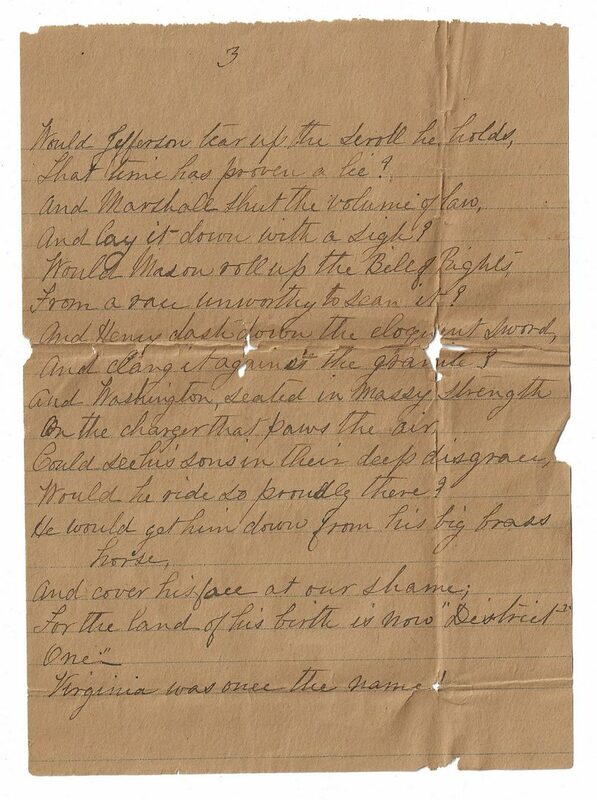 10 3/4" H x 8 1/8" W. 5th item: Three (3) page ink on ruled paper poem titled "On the raising of the Bronze Statue (Figure) of Chief Justice Marshall on the Washington Monument in the Capitol Square, Richmond (in 1867)" by Louis Randolph. 8 1/4" H x 6" W. 6th item: Four (4) page ink on double-sided and folded ruled paper untitled speech about the life of John Marshall, unsigned and undated, written after Marshall's death. 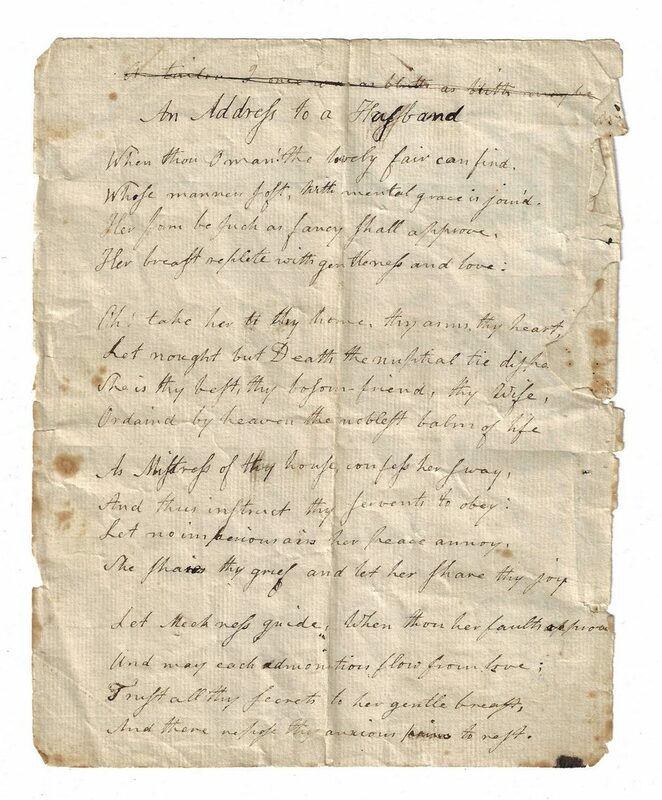 7 1/8" H x 4 5/8" W. Provenance: the Estate of Charles Boyd Coleman, Chattanooga, TN; descended in his family from Pamela Augusta Gilman, granddaughter of Gen. Henry Dearborn, on April 2, 1822 . 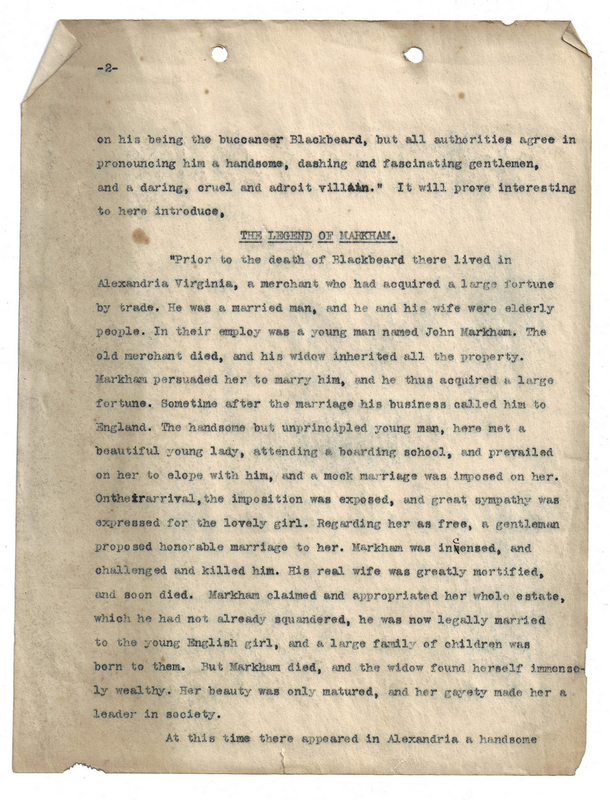 Her daughter, Annette Maria Dearborn Boyd, was married to Charles Harrod Boyd; they had four children including Julia Wingate Boyd (wife of Lewis M. Coleman, Jr., a direct descendent of U.S. Chief Justice John Marshall) . 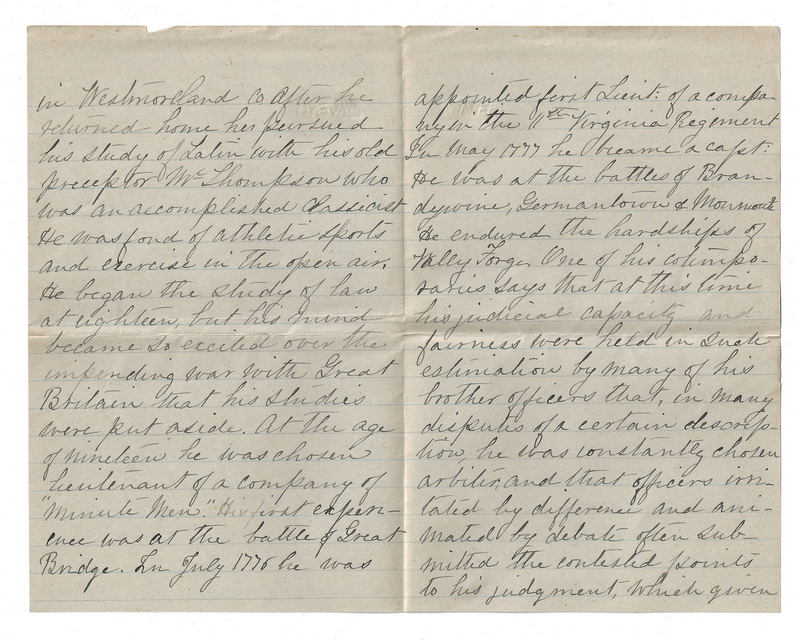 Source: "The Maine Historical and Genealogical Recorder", Vol. 3 by S.M. Watson, 1886). CONDITION: 1st item: Front cover missing 10" x 2 1/4" section from right side, with 4" tear lower left. Heavy foxing, few areas of insect damage, areas of dampstaining to front cover, first two pages, back cover, and last two pages. Original stitching intact. 2nd item: Overall good condition with foxing spots, tears, to be expected from age. 3rd item: Heavy foxing front cover and title page. Back cover almost separated from stitching. Original stitching intact. 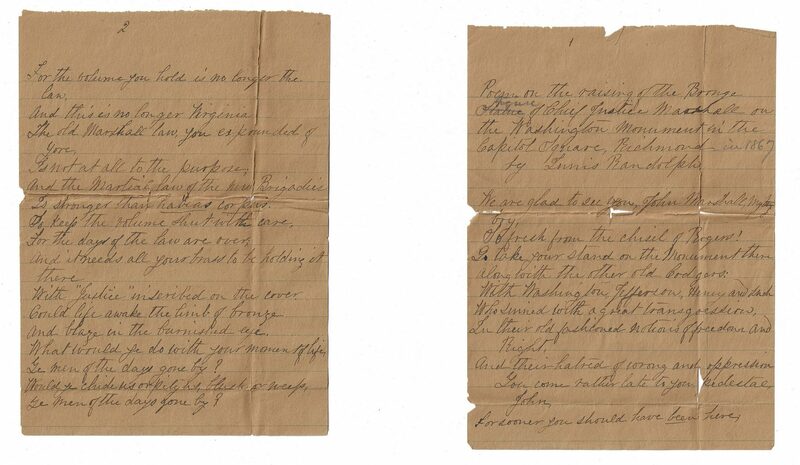 4th item: Few handwritten revisions in ink. Heavy toning to first page. Foxing spots, tears, surface of pages. 5th item: Overall good condition with areas of dampstaining. 6th item: Overall good condition with toning to pages and tears, largest 2 1/4", along fold lines. 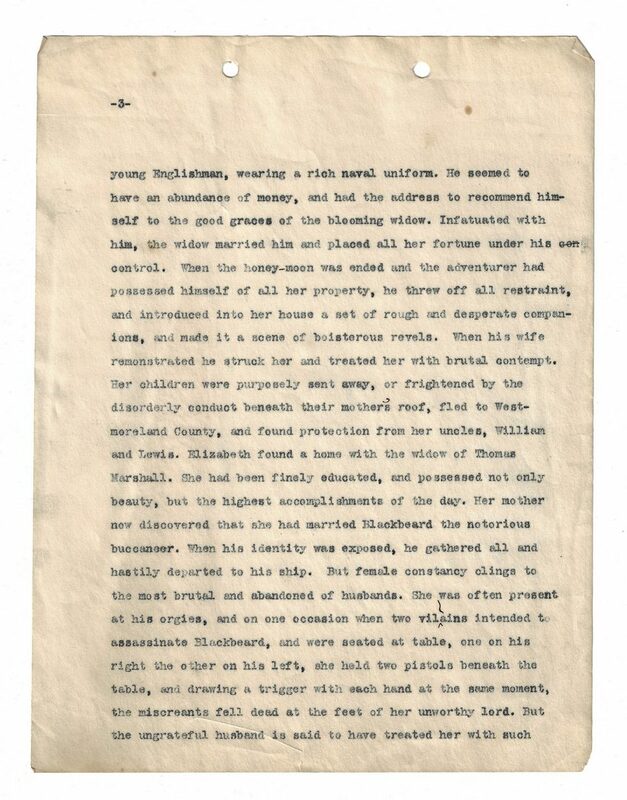 Few pencil corrections including addition of the word "figure" and the dated.